If you have been reading my blog from the beginning (so…2 people, maybe), this post may sound a little familiar. You see, I’ve done this craft before. Here. Almost exactly a year ago, but before Kenny and I were married, so basically ages ago. It’s just that when my parents’ start tearing up buildings on the farm, AKA BARNS I get a bit excited. 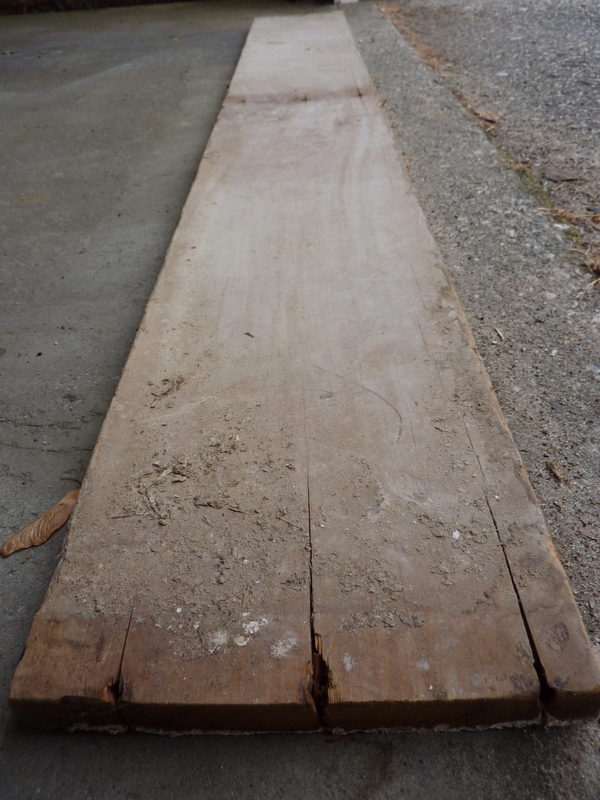 I see all of this old, beautiful BARN WOOD and I start getting these Grand Delusions. I begin to think that I will hoard this disassembled barn and make things out of the wood. Then I think that I should probably quit my job to devote all of my time and energy into this yet-nonexistent but entirely probably very-successful venture. And then I begin to think that my Business Empire can help to Save the World. I’ll employ people! I’ll donate! I’ll send these to third world countries because I am a Philanthropist (capital “P”). (It escalates quickly, I know. I have to live with myself constantly). But then I blink, and come down to reality. I like my 9-5. And while I enjoy doing crafts, my attention span is about as long as a toddlers. And once I do something, I don’t normally have a burning desire to do it again (recreate the wheel and all that). But I can’t help but snag a board or two for fun, special occasions. One such special occasion presented itself on Sunday, when one of my best friends had her first bridal shower and I needed a gift. 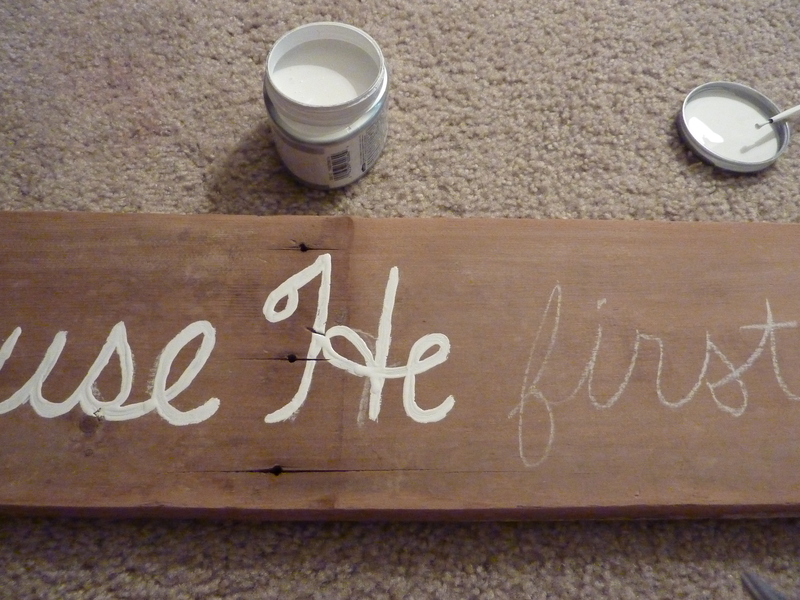 Sometimes homemade gifts can go horribly wrong, so I had budgeted for a Plan B. But it turned out just fine. Why am I still talking? You want to see pictures. Here’s the board, which was formerly a barn. As you can see, I needed to do a little clean up. Nail removal had already occurred for transportation-safety purposes. So I washed it and sanded it to within an inch of it’s life. It was then more deserving of a better photo backdrop than the garage floor and our duvet cover sufficed. Chalk allows for a multitude of errors, which is also nice. Paint is a little less forgiving, but let’s keep it in perspective. This is supposed to be rustic. 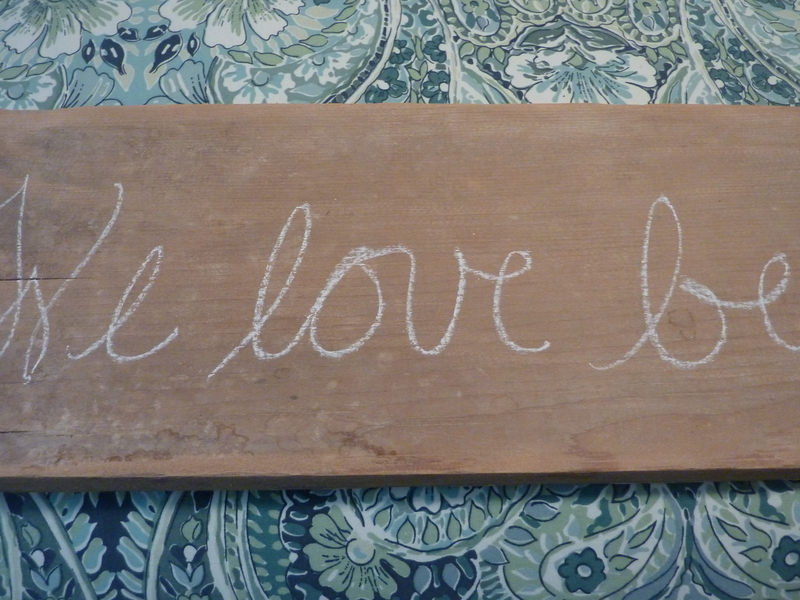 Then, because the letters were a little too crisp and white, I attacked the board with some sandpaper and rustick-ed it up. 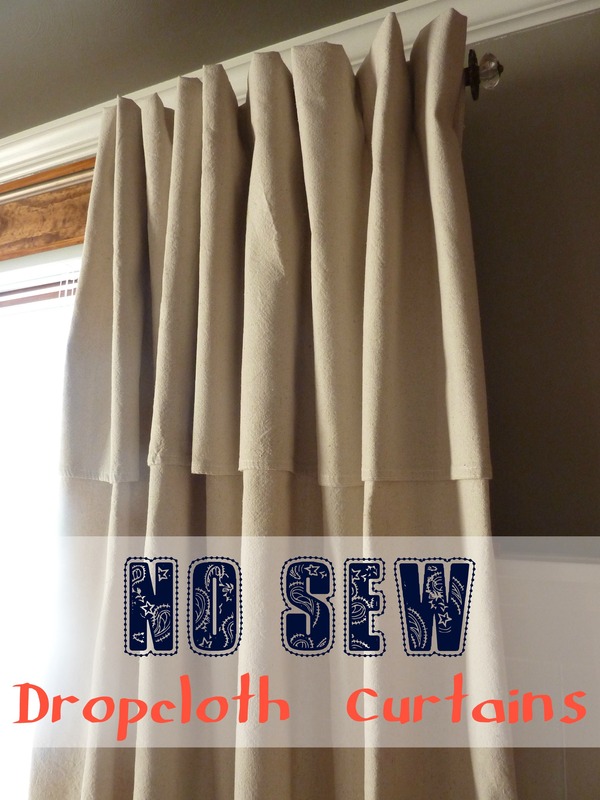 It also made it super soft and silky feeling and so I didn’t seal it with anything. That could happen, but I liked the unfinished, matte look. 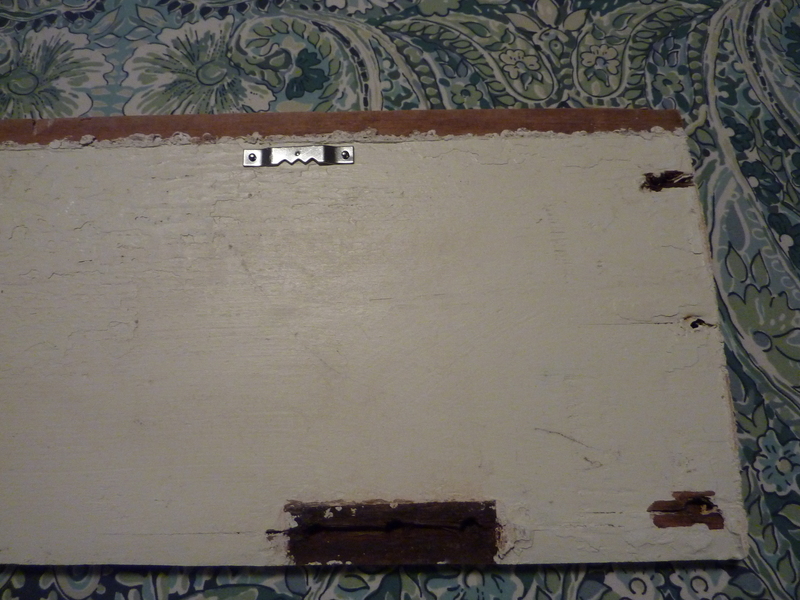 To the back of the board I affixed two tiny picture-hanging hooks, the kind with the little teeth. Those are hinge marks in the paint, so I think this board came from somewhere really mysterious and glamorous like a door or cabinet. So, even though I didn’t end up saving the world (YET), I did manage to make a semi-acceptable bridal shower gift. 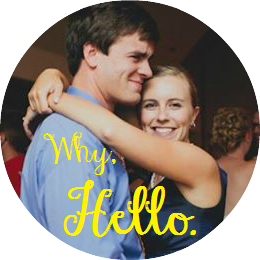 Cheers to Lorie and Phil on their upcoming nuptials! 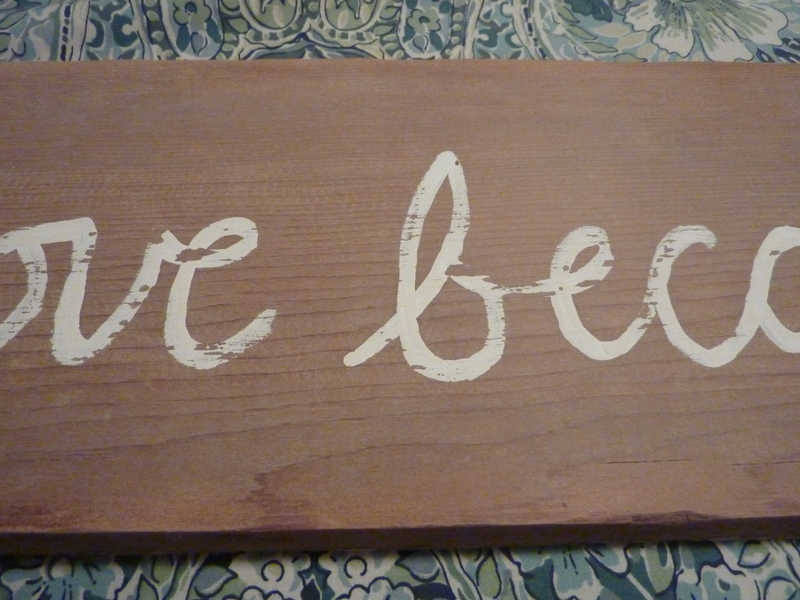 Categories: DIY, Home Decor, Marriage | Tags: barn wood, distressed, rustic, rustic barn wood art, sandpaper | Permalink. I love it! great job! I’m sure Lorie loved it as well! Love it as well! Looks amazing! Looks so good! 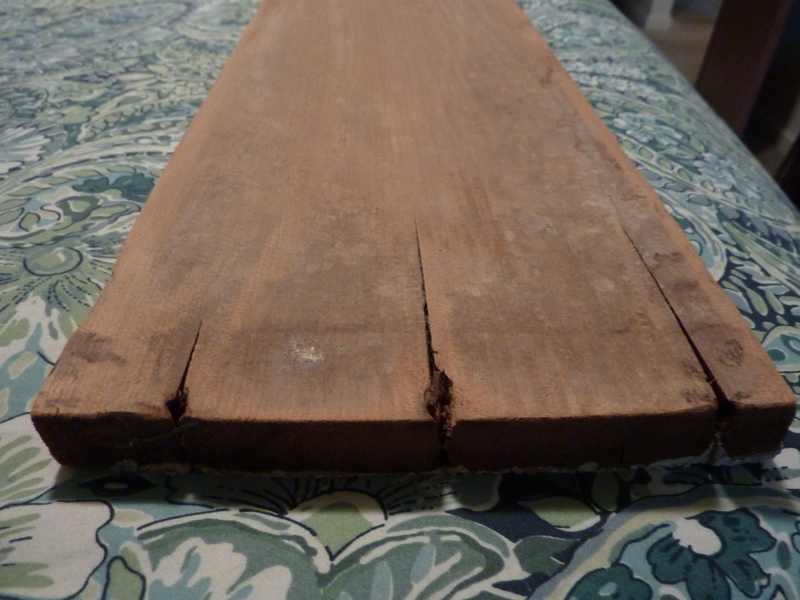 It just so happens that I stole some barn wood from my in-laws this weekend! hmmm….. Yes! Can’t wait to see what you do with it! It is more than “semi-acceptable!” It is FABULOUS! I love it as much as Lorie does and I am jealous. All her gifts are currently stored at my house and I am still trying to figure out a good hiding place for it so that it can’t leave MY house! AND we had to sneak it out of Rosemary’s home…she was trying to nab it as well. As for me, I totally believe you could make it in the business world on your own! YOU are awesome! You know, I do the same thing every time I make something. I turn it into a business in my head. One where I conquer every issue I have ever had. Then I 85% complete the project and lean it somewhere indefinitely. haha I’m so glad someone out there dreams up an imaginary world of quitting the job and going full time crafter! #bibleforthewin might be my new favorite hashtag!! 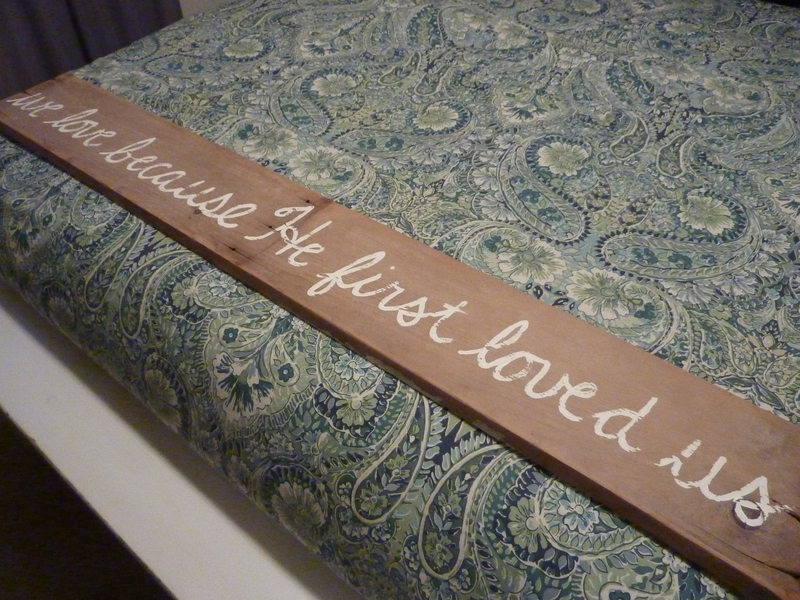 Love that verse and love the gift…what a lucky recipient! oh and PS: love the new design of the blog! Thanks! It’s like rearranging furniture…so refreshing (but very chaotic while it is happening)!